It's a new year and I strive to continue growing my walk with God and keeping in His word. What better way to start of the year then with wonderful tools and resources that allow me to do this, am I right? 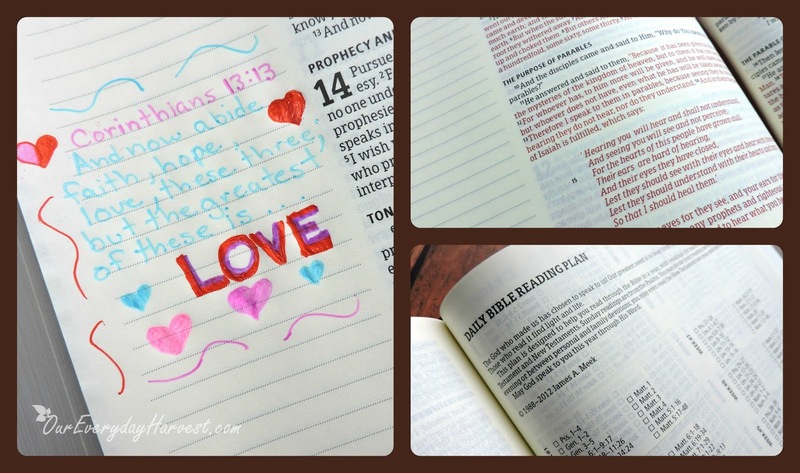 Bible journaling is something that I started doing in early adulthood and just continued with it for about twenty plus years (I probably just hinted at my age range there). I would keep notebooks and separate journals to jot down favorite scripture passages and words that were personally spoken to me by God. It wasn't until a few months ago that I started delving into journaling in an actual Bible. Recently, I was introduced to another Bible that was created for this specific purpose, the NKJV Notetaking Bible. This is a really well-made Bible that has a beautiful bonded leather cover. For those who can't decide if they'd prefer a soft leather bound cover or hardcover, this provides a fine mix of both. I always appreciate when publishers print the words of Jesus in red, and this Bible also offers this feature. The 1.75-inch ruled margins are what make this an official notetaking Bible. Each page includes these margins, which are suitable for journaling, prayers, reflections, scripture reference, and pretty much anything else that you'd like to add during your studies. I've also noticed that there are additional fully-lined blank pages at the end of many of the books. This is a nice addition, especially if you require extra space to write. There are two things that I wish I could change about this particular release. For one the pages are a bit thin. I own several Bibles with pages that are comparable, but for journaling purposes, I would have much preferred thicker pages. I've noticed a bit of ghosting when I add notes. Of course this can vary depending on the writing tools being used. I'm personally still on the look out for an incredible set of pens that will compliment my Bible notetaking. My only other wish would be for the text to be a bit larger. I do have similar Bibles with font this small, but for some reason I find this Bible is a bit more difficult for me to read. Perhaps the ink is slightly lighter. While there are some minor things I would change, all in all this is a really nice Bible. 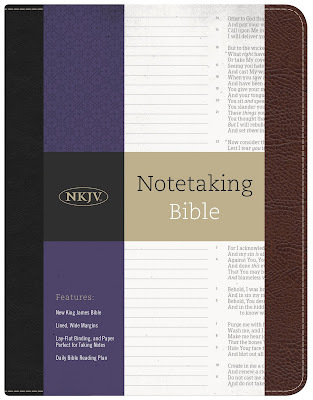 If you're looking for a straightforward resource to study God's word, with the added space for taking notes and journaling, then the NKJV Notetaking Bible may just be what you need. I personally enjoy the fact that it has extra blank pages to write on, in addition to the margin spaces. The New King James Version also offers an easy to read format, that still keeps aligned with the traditional text of the King James Bible.